We are so delighted to support Carl and Susan in this art exhibit of their work together. We are currently working on a film portrait of both of them with filmmaker Mike Attie, that we expect to premiere this fall. In the meanwhile, join us for a wonderful art exhibit and reception! Carl Duzen, a former physics educator was diagnosed with Alzheimer’s disease on Sept 11, 2014. Faced with that devastating news, his desire was to “Just live my life.” As he himself said, “Alzheimer’s attacks the brain, but I can attack back!” While Alzheimer’s shuts many doors in one’s life, Carl’s goal has been to find new doorways that will help him maintain purpose. Previously, Carl built computers and electronic devices as well as taught high school mathematics and physics. Through his wife, artist Susan Jewett, he also developed a deep interest in art. Once Alzheimer’s struck however, Carl had more difficulty building, and instead became fascinated with taking things apart. Over this past year, Carl has been taking apart electronics, extracting the copper wire, and organizing it into various forms. Susan has then selected the most intriguing forms and placed them in spatial relationships against various backgrounds within box frames. 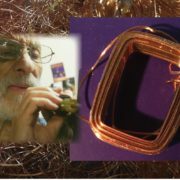 Thus, although the process was originally begun in response to the constraints of Alzheimer’s Disease, these art pieces demonstrate Carl’s urge to go forward with purpose, and his desire to continue to live with meaning, passion, and hope.